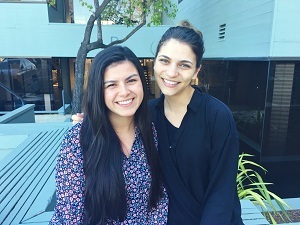 Two Palo Alto University doctoral students were awarded a research grant by the American Psychology-Law Society (APA Division 41), for research on psycholegal issues related to diversity. Marissa Vasquez and Sierra Shumate, both students in the Ph.D Clinical Psychology program, submitted their project titled: A Spanish Translation of a New Malingering-Detection Measure of PTSD. The goal of their research project is to establish a standardized, Spanish-translated measure for malingered Posttraumatic Stress Disorder (PTSD) detection in order to increase available forensic psychological measures for Hispanic/Latino populations. The competition for this award is high, with only five given annually. “The quality of the funded proposals is very strong and includes research that makes significant advances to the field of psychology and law, especially in the area of diversity.” stated Christopher L. Bishop, Psy.D., Co-Chair of the Diversity Research Award subcommittee of the Minority Affairs Committee.